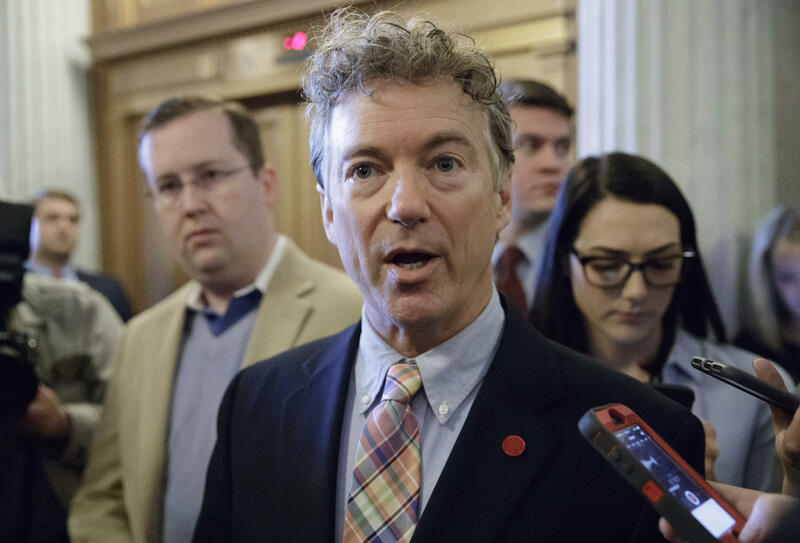 Senator Rand Paul's neighbor Rene Boucher has pleaded not guilty after being charged for attacking the Senator at his Kentucky home. Paul is currently recovering after he was allegedly tackled from behind by Boucher for what Boucher's attorney told CBS News in a statement "was a very regrettable dispute between two neighbors over a matter that most people would regard as trivial." But Paul appears to be disputing claims made by his next-door neighbor's lawyer that a "trivial" dispute over landscaping issues were at the root of a recent dust-up that left the senator with six broken ribs. The statement did not further describe what precipitated the attack. It did note that Boucher and Paul have been next-door neighbors for 17 years and said that the two, both physicians, had worked together when they were both practicing. "We sincerely hope that Senator Paul is doing well and that these two gentlemen can get back to being neighbors as quickly as possible." But Paul's most recent tweets suggest the drama may not be as minor as Boucher's attorney makes it seem. Paul tweeted links to two reports by Breitbart News and the Washington Examiner, both claiming the reports of a "landscaping dispute" were erroneous, citing various neighbors of the Paul family. "The stories of a 'landscaping dispute', or a dispute of any sort between Rand Paul and Rene Boucher are erroneous and unfounded. The reason for Mr. Boucher's bizarre attack is known only to him. Statements to the contrary are irresponsible and unnecessary," wrote neighbor Travis Creed in an email to Breitbart News. This speculation regarding Boucher's motive, Creed says, "has led to an unfair characterization of the Pauls and their home." Another neighbor, Dan Renshaw, told the Examiner, "This episode is so wrong on so many levels, to be absolutely blindsided and attacked while mowing one's lawn. I can't imagine being in my yard pulling weeds or mowing and being totally attacked by anyone, much less my neighbor? It's hard to believe he was out of jail the next morning on a $7,500 bail." Both outlets also reported that Boucher had anti-Trump leanings, reportedly posting negative rants about the administration on social media. But according to Boucher's attorney, the matter had "absolutely nothing to do with either's politics or political agendas." Meanwhile Senator Paul's chief strategist Doug Stafford said in a statement to CBS News, the Paul family hadn't had any conversations with Boucher "in many years" and that Boucher was a "disturbed person." "This was not a 'fight,' it was a blindside," said Stafford. "Anyone claiming otherwise is simply uninformed or seeking media attention." Paul tweeted an update on his health status on Wednesday that his condition was worse than previously known. Paul said a final report revealed six broken ribs and a pleural effusion — excess fluid around the lungs — which is worse than the five broken ribs reported Monday from the attack. Initially, Boucher was charged with fourth-degree assault, indicating only a minor injury. Paul told police that Boucher came onto his property and "tackled him from behind, forcing him to the ground and causing pain." Paul, according to the arrest warrant, had injuries to his face, "including small cuts to the nose and mouth area," and he was having trouble breathing "due to a potential rib injury." Boucher was ordered not to contact Paul or his family and stay 1,000 feet away. Boucher is also barred from possessing firearms. A pretrial conference was set for November 30th at Thursday's hearing.